Powered Order Picker Stacker POPS-10(POPS-10) - Noveltek Industrial Manufacturing Inc.
Adjustable Forged Forks, Suitable For Any Kinds Of Pallets. Raise The Forks A Further 800mm For Picker Use. The Max. Fork Lifting Height Is The Max. Lift Table Height Plus 800mm. Ride-On Platform At Back-Side For Driving Use. 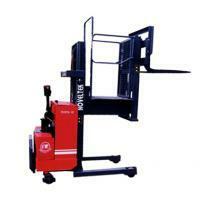 Double Hydraulic Control Systems In The Lift Table And Ride-On Platform. Electronic mosfet stepless is standard.